This is an interesting article by Sheila Pritchard which, while written in 1994, is particularly apt today as all the Christian Churches struggle to remain relevant. A visitor to an Australian outback cattle ranch was intrigued by the seemingly endless miles of farming country with no sign of any fences. He asked a local rancher how he kept track of his cattle. 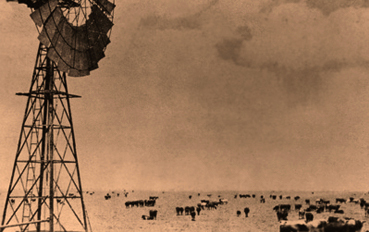 The rancher replied, “Oh, that’s no problem. Out here we dig wells instead of building fences.””Out here we dig wells instead of building fences.” The implication, I hope, is obvious. There is no need to fence cattle in when they are highly motivated to stay within range of water, their most important source of life. Let’s consider this as a paradigm for a type of spiritual growth which is based on digging deeper wells rather than on building higher fences. To do this we need first to take a little excursus into mathematics. I promise it will be brief. The word “set” in mathematics refers to a group of objects which belong together because they have some defined similarity which marks them out. For example a set of all odd numbers would include 1, 3, 5 and 157 but not 2, 4 or 100. Sets can be defined in various ways. For example: in a roomful of people the set of males is usually a clearly recognisable set which could be further divided into subsets of single males and married males. Or we could define a set in terms of age, the set of those under thirty-five; or in terms of knowledge, the set made up of all those who know what the prophet Ezekiel was instructed to do with the hair he shaved from his head and beard (Ezekiel 5). Or behaviour, the set of those who have not exceeded the speed limit today. It is possible that someone here might have been included in all those sets. On the other hand, any speedy female over thirty-five who doesn’t know Ezekiel intimately will have been excluded from them all. Obviously the way we define sets determines who or what is included and excluded. Only one further piece of theory is needed. Most sets are bounded sets. In other words, the focus is on the boundary. At 50 kilometers per hour you are within the set of law abiding drivers, at 51 kph you are not. If you turn 35 tomorrow you are within the set of under thirty-fives. If your 35th birthday is today, you are not.However, there is another kind of set where the focus is not on a boundary but on relationship to a central goal. For example, the set of those who are losing weight. There is no boundary defined by a specific number of kilos. Rather, the central goal is weight loss. All those moving in that direction are included in the set. Or take another example, the set of all those whose central relationships are growing stronger in intimacy and communication. Again, the crucial feature of the set is not a boundary but the direction of movement towards (in this case) a relational goal. This kind of set is called a centred set. So we have bounded sets and centred sets. Or if you prefer stories to mathematics, we have fences (bounded sets) or wells (centred sets).Paul Hiebert, a missiologist from Trinity Evangelical School of Divinity (Deerfield, Illinois, USA) suggests that it makes a great deal of difference to our perspective on evangelism and mission whether we think of Christianity as a bounded set or a centred set.If we take a bounded set view, who qualifies? Where precisely is the boundary? Who is “in” and who is “out”? How much must a person know of doctrine and scripture before we can call that person a Christian? What differences of lifestyle need to be apparent as proof of change? At what point has conversion taken place? These are tough questions. Hiebert suggests that it is much more realistic and helpful to think of Christianity as a centred set, a set defined by movement towards the centre, the person of Jesus. Now, conversion is the point at which a person turns towards the centre and begins the journey. That new fragile follower of Jesus (about whom he or she may know very little) is as much part of the centred set as is the missionary who told him the gospel story. The fact that the missionary has a degree in theology is irrelevant to defining the set. The fact that they are both moving towards the central goal is what matters. We’ll leave the implications for cross-cultural mission for the moment and turn our attention to the implications for ourselves. If we view Christianity as a bounded set we will pay a lot of attention to the boundaries. We will have clearly defined parameters as to what constitutes a Christian, usually linked to certain doctrinal statements, understanding of those beliefs, and commitment to them. We will have our ways of determining who is “in” and who is “out”. Another feature of bounded sets is that they are static. Once within the set no further attention to definition or development is needed. To take a non-spiritual example, let’s identify the set of Granny Smith apples. A Granny Smith apple is a Granny Smith apple whether it is ripe or unripe, rotten or shrivelled up. Those factors may be very significant to the consumer of the apple – but they have no bearing on its designation as a member of the set. I leave you to draw your own parallels. But what if we view Christianity as a centred set? Centred sets, you remember, are created by defining a centre and the relationship of things or people to that centre. All those attracted to the centre and moving towards it are members of the set. All those moving away from the centre are not members of the set. Distance from the centre is not as important as direction of movement. One person can be close to the centre but moving away from it; another may be less close but moving towards it. 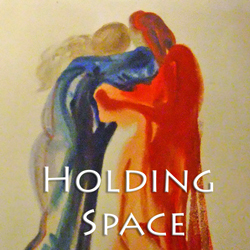 Although boundaries are not the primary focus of this set, there is a clear distinction between those moving in and those moving out. The primary characteristic of centred sets is that they are dynamic not static. In other words there is always attention to direction of movement. It is “movement towards” that defines the members of the set, not a boundary. Or Jesus in his discourse to the Jews in John 5: “You search the scriptures because you think that in them you have eternal life; and it is they that testify of me. Yet you refuse to come to me to have life.” Jesus clearly does not undervalue doctrine or the study of scripture or verbal commitment. But what he does is to indicate that they cannot be used as “fences” to define disciples. The emphasis throughout the gospels is never primarily on what theological understanding people had but on whether they were willing to follow Jesus. So who is the true disciple – the churchgoing graduate who can defend Christianity against all opponents in a theological argument, or the hesitant, barely literate young woman who comes to the drop in centre but never to a church service? From the perspective of bounded set thinking the answer is obvious. The graduate is clearly “in”. The young woman “out”. But from the perspective of centred set thinking we cannot answer the question without more information. We need to know about the personal relationship of each to Jesus. If the young woman is, however stumblingly, moving towards discovering what relationship with Jesus can mean for her, while the churchgoer is quietly ignoring all aspects of personal commitment and prayer, and moving towards increasing self sufficiency, materialism and disregard for others, what then? 1. Radical Commitment: We need to take a new look at what Jesus’ life was really like. It was radical and it was non-conformist. It involved lack of security in physical terms. It was characterised by opposition from the religious establishment and frequent misunderstanding and hardship. It was marked by an absolute priority given to time to be alone listening to God, and by self-giving love that cut across all social and cultural boundaries. Jesus was as much at home with non-Jews and outcasts as with those of his own race and social standing. His friendship was available to those whom others would shun and avoid. I could go on and on – but it is this Jesus the centre of the Christian faith. And if movement towards likeness to him is the goal, we need to be clear about what that commitment really means. 2. 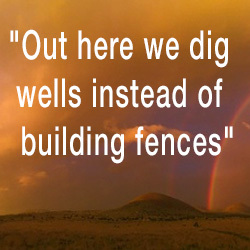 Challenging Responsibility: Living with wells rather than fences feels very risky at first. Apparently when ranchers introduce cattle which have been used to fenced paddocks into freedom to move around in the Australian Outback, the cattle tend to huddle nervously around the well or water source, fearing to move very far. Fences provide a feeling of security but they also allow a certain degree of complacency. To no longer rely on boundaries which keep me in and others out leaves me exposed and responsible. Now I cannot doze peacefully in the shelter of the fence. I must stay alert and active in my connection to the source of life which alone is my security. And that source of life and security is in Jesus and a living relationship with him, not in a theoretical fence which absolves me from action. 3. Freedom from Defensiveness: Paradoxically, however, the nearer you are to the centre the more freedom there is to explore widely. After a while the cattle on the ranch realise both their security and their freedom and no longer need to huddle. Similarly, a deep relationship with Jesus develops in his disciples a confidence which transcends fearful huddling. It enables them to reach out in ever widening circles of experience and relationship without defensiveness – just as Jesus did. His confidence in who he was in relation to God enabled Jesus to cross boundaries of every kind. Christians who have that kind of freedom from defensiveness and fear seem to attract others to the well also. This kind of freedom is quite different from license or from a grey wishy-washyness. Remember the determining factor is likeness to Jesus – and no one could call him wishy-washy! 4. Dynamic Growth: Another aspect of this freedom is that there is always room for growth. Bounded-set thinking can stunt growth. What often happens at transition points such as adolescence, young adulthood or mid-life, or at some life crisis, is that the previous theological boundary is no longer adequate. And because the focus is on the boundary, the person faced with this uncomfortable fact feels as though the only choice is to “step outside” the boundary. I think many people leave our churches for this reason and are often labelled as having “lost their faith” when in fact what may be happening is very faith-full. The freedom of centred-set thinking over bounded-set thinking is that it allows each of us to expand and explore as each new life experience challenges us. The only criterion is ongoing relationship to Jesus. Spiritual growth, from a centred-set perspective, is not optional. We all know that in this life we will never come to the end of the process of being conformed to the likeness of Jesus. In bounded-set thinking, it is quite possible to stop moving towards Jesus without any great sense of concern. Whereas in centred-set thinking it is that very movement from “one degree of glory to another” that marks us out as those whose life comes from “the Lord who is the Spirit” (2 Corinthians 3.18). In Philippians 4.10-15 Paul gives his own view of spiritual growth: “I want to know Christ and the power of his resurrection and the sharing of his sufferings by becoming like him in his death, if somehow I may attain the resurrection from the dead. Not that I have already obtained this or have already reached the goal; but I press on to make it my own, because Christ Jesus has made me his own. Beloved, I do not consider that I have made it my own; but this one thing I do: forgetting what lies behind and straining forward to what lies ahead, I press on toward the goal for the prize of the heavenly call of God in Christ Jesus. 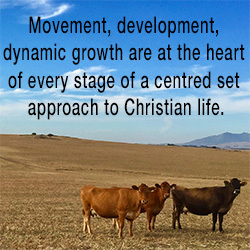 Let those of us then who are mature be of the same mind; and if you think differently about anything, this also God will reveal to you.” Movement, development, dynamic growth are at the heart of every stage of a centred set approach to Christian life. 5. Evangelism by Attraction: Evangelism in centred-set thinking is motivated by personal, life-changing experience of Jesus. It focuses on pointing others in the direction of the source of life. It “works” by attraction to the centre. Our lives serve as witnesses to the extent that they contagiously attract others to what has so captivated us. Sadly, some forms of bounded-set evangelism pay more attention to the numbers of people who can be corralled within a particular doctrinal, or even denominational, fence. They do little to attract folk to the Jesus of the gospels. A good biblical example of centred-set evangelism is the Samaritan woman at the well (John 4.1-26). Her own encounter with Jesus so transformed her that she was freed from defensiveness and fear in such a remarkable way that even those who had previously shunned her were attracted to the source of life she had found. Are our lives dynamically connected to their source in Jesus and freely and fearlessly crossing boundaries to attract others to the same well? Or have we lapsed into complacent sheltering inside a respectable theological fence which hides our own lack of movement and serves mainly to keep others out?